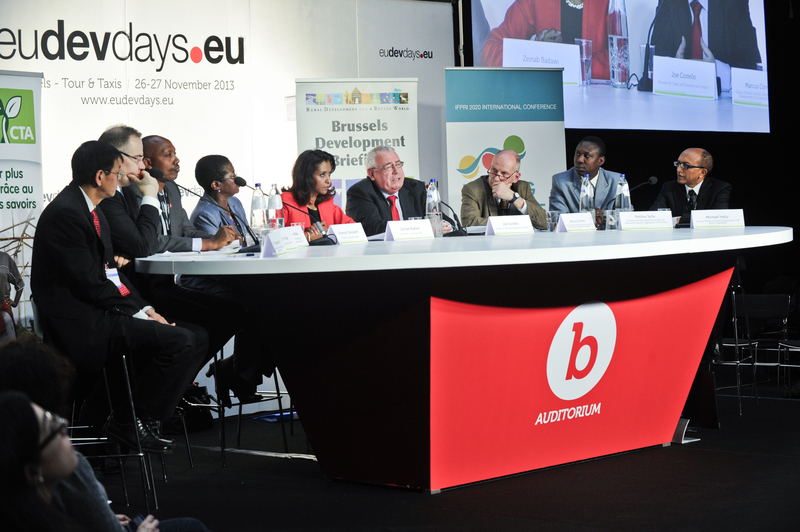 Resilience-building for improved food security and nutrition requires urgent action and integrated, multi-stakeholder approaches, said speakers on November 26, 2013, at a high-level panel during the European Development Days (EDD) 2013 forum in Brussels. The panel, moderated by BBC journalist Zeinab Badawi, was jointly organized by the Technical Centre for Agricultural and Rural Cooperation (CTA), the International Food Policy Research Institute (IFPRI), and the PanAfrican Farmers’ Organization (PAFO). The panelists discussed shared lessons and gave their perspectives on the matter. More than 200 people attended the panel, and various participants have had the opportunity to raise their questions and share their experiences. The panel has been web-casted and the video can be downloaded here. Understanding the multi-faceted dimensions of food security, nutrition and resilience is crucial for combating hunger and poverty in the long term. Smallholders account for a large share of the world’s vulnerable and food-insecure populations. To reduce and manage risks, they need access to climate-smart agricultural technologies and practices, safety nets, educational opportunities, financial services and pro-poor policy environments. Investments in disease-resistant crop varieties reduce vulnerability to crop losses and improve food and nutrition security. Programmes such as cash and in-kind transfers, work-for-food and nutrition education campaigns can also help raise household income and consumption of healthy foods. The impacts of price volatility can be mitigated by safety nets, information systems, index insurance and risk management instruments. Building resilience implies anticipating the likelihood and location of shocks; promoting preventive measures; mitigating damage and encouraging recovery and restoration where damage is inevitable. The panelists, in this session co-organized by CTA and IFPRI, shared lessons and successes from past experiences in building resilience and explored policy options for the future. Speakers came from different parts of the world, highlighting unique experiences: Joe Costello, Minister for Trade and Development, Ireland; Florence Chenoweth, Minister of Agriculture, Liberia; Ernest Ruzindaza, Permanent Secretary of the Minister of Agriculture, Rwanda; Shenggen Fan, Director General of the International Food Policy Research Insitute; Michael Hailu, Director, Technical Centre for Agricultural and Rural Cooperation; Kalilou Sylla, Executive Secretary, ROPPA; Stephan Tanda, Managing Board Member, DSM. Florence Chenoweth, Minister for Agriculture in Liberia, drew attention to past decisions of national agencies and governments to reduce spending on agriculture, noting that “this is what has come to haunt us.” She called for increased attention to reducing the burden on women in agriculture through improved inputs and tools, as well as a stronger focus on issues of land ownership. Farmers in Liberia do not face problems growing small patches of crops, said Minister Chenoweth, but instead lack the formal rights to land required to grow long-term crops, a necessary investment for increased resilience. Ernest Ruzindaza, Permanent Secretary of the Ministry for Agriculture and Animal Resources in Rwanda, reiterated the importance of committing public finances to agricultural growth, as several African countries have done through the Comprehensive Africa Agriculture Development Programme (CAADP). Rwanda’s efforts to build resilience for food and nutrition security have also focused on investing in people: “For resilience-building, a people-centered development approach is key. If you want to build resilience for your people, you need to invest in them,” said Mr. Ruzindaza. This kind of investment requires a multi-sectoral approach, demonstrated through Rwanda’s integrated plan for food security and nutrition that brings together the ministries of agriculture, finance, local government, health, education, and gender. Stephan Tanda, Managing Board Member of Royal DSM, also emphasized the role of the private sector in building resilience for improved food security and nutrition. He said the private sector is “an indispensable partner in providing nutritious food.” Public-private partnerships, like those that Royal DSM is piloting in Rwanda, can help local producers improve the micronutrient content of their products and help governments provide more nutritious food to millions of hungry people every year. These efforts must start with policy, said Mr. Tanda, as a strong national plan is essential to make a country nutrition-resilient. Strong government commitment and leadership is key, agreed Michael Hailu, Director of CTA. He noted that it is equally important to “engage local communities and have indigenous knowledge of communities contribute to resilience-building.” CTA brings together a range of stakeholders, from policymakers to farmer organizations to donor communities, in all of its work. For example, CTA used participatory mapping tools with indigenous communities to help incorporate local knowledge into land-use planning and climate change adaptation programs. Shenggen Fan, Director General of IFPRI, described the market and environmental shocks that global and national food systems have faced for the last several years. He said that people, whether poor consumers or poor farmers, deserve nutritious food but “unfortunately, for the last seven or eight years, access to nutritious food has not been secure… These vulnerabilities will continue if we do not take quick actions.” Dr. Fan noted that youth can play a significant role in transforming the agriculture sector in Africa, but they need improved access to land as well as financial and technical services. He also pointed to the unique role played by research organizations in addressing knowledge gaps related to resilience-building and bringing attention to areas that require further research support. The current discussions surrounding the post-2015 agenda offer an opportunity to ensure that resilience is addressed. As the panelists agreed, moving from commitments to policy engagement to sustained change will require strong leadership by national governments, improved delivery mechanisms, and partnerships across sectors. I am genuinely happy to read this website posts which carries plenty of useful information, thanks for providing these kinds of data.